Use unshielded, twisted-pair (UTP) cable to route data, phone, fax or modem signals. Connect with patch cord to the Decora Media System Hub, the Telephone Distribution Module included in Leviton’s Pre-Configured Structured Cabling Panels, a key system or a network hub. 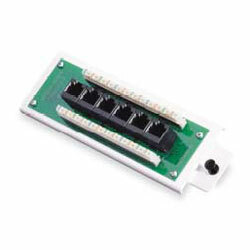 This printed circuit board module with six Category 5 ports meets FCC Part 68 and TIA/EIA standards. Unit comes with bracket.